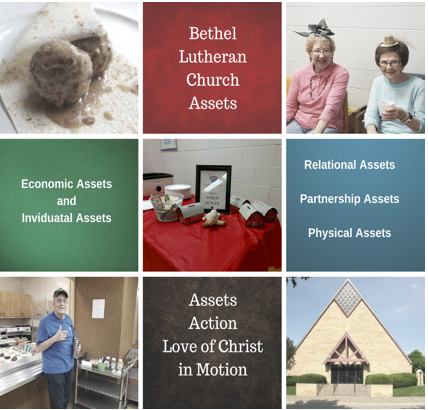 This is a new feature article of the “Bethel Bits.” Each month stories about the action items that emerged from the May 2018 Asset Mapping Events will be shared here. Five Action Teams met after worship on Sunday to beginning the planning process. The goal is to complete these five action events between September 2018 and December 2019. We are at the beginning of this ministry of Christ acting in the world with our unique asset-infused ministry ideas. Each of the action events will evolve over time. The goal is to let this happen and trust the Holy Spirit as we participate in making Christ known on the northside of La Crosse. There is an open invitation for you or any of our neighbors to join in making each of these asset-ministry events. Each team leader, along with Pastor Anne are available for questions of interest and concern. Listen below are the five teams, a brief description of the goal of the action event, and the team leader. Goal: to explore ideas related to community gardening and sharing the food grown with neighbors in need. Goal: to partner with local experts in the field of social work, pharmacy, law enforcement, and drug addiction to hold a learning event for congregations and our northside neighbors. Goal: to design and build simple bird houses with children. This is an intergenerational events with all ages working together to build and share the bird houses. Goal: to offer a place for kids to play parents are running errands, out with friends, or having quiet time for themselves. The 90-minute play time will be infused with games, art classes, music, and Bible stories. Goal: to partner with the American Red Cross to hold a campaign for blood donors.